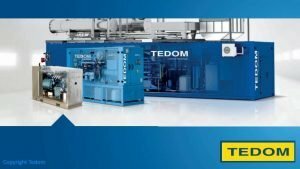 TEDOM biogas electric generator units range from small 7kW units up to 10,000kW generator sets. The following Biogas Electric Generator Suppliers List US, shows United States generator set suppliers which provide electric power generators to produce electricity from biogas made using the anaerobic digestion process. Each of these manufacturers and/ or distributors of engines is listed in the “AgSTAR Vendor Directory for Manure Digester Systems”, and has completed that directory as a US provider or has a US subsidiary company. Each one offers a unique product and service, so we suggest that potential biogas electric generator buyers research all of them to find out which most closely matches your requirements. Sizes range from 10kw output natural gas generator to a 100kw/125kva generator, 220 volt motor, natural gas electric generator. The generators shwon below may be suitable for use with purified upgraded biogas (biomethane) which very closel matches natural gas quality. CGP Resources, LLC CGP Resources, LLC produces gas generator sets and cogeneration based on combustion engines; it also manufactures combustion engines for stationary application for natural gas and biogas. Charles Equipment Company USA | IL Charles Equipment Company supplies engines, generator sets, controls, switches and switchgear, and cooling systems for landfill-gas-to-energy (LFGTE) projects. It also provides custom design services and furnishes operating cost studies, layouts, and specifications. Coffman Electrical Equipment Company USA | MI Coffman Electrical Equipment Company is a distributor of a variety of biogas generators and micro-turbines. It also works as a consultant in directing clients to the best possible digester design for maximum generation capability. It offers a variety of gas scrubbing and material drying systems. Enerflex Energy Systems USA | CO Enerflex Energy Services is a distributor for Waukesha Engines and Generator packages. It is also a manufacturer of customer power generation and gas compression packages. Gulf Coast Green Energy USA | TX Gulf Coast Green Energy is the distributor for the ElectraTherm Power+ Generator and specializes in installation and commissioning for internal combustion engines as well as other applications that take waste heat from engines and produce additional electricity. ElectraTherm ORC technology has been used extensively (50+) in Europe on biogas farm projects to provide an additional 10-15% electricity from the big internal combustion engine’s waste heat. Inland Power Group USA | WI Inland Power Group is the Midwest Distributor of GE Jenbacher gas engines. Jenbacher products, ranging from 330 kWe to 3 MWe, are highly developed and tested, and well matched to each customer’s specific requirements. Its scope of delivery comprises generator sets for onsite power generation and cogeneration systems for decentralized power and heat supply. Both power systems are also available as fully containerized plants for maximum flexibility. Martin Energy Group Services, LLC USA | MO Martin Energy Group, formerly Martin Machinery, LLC, first entered the bio-gas industry with the design and construction of switchgear to parallel an induction generator to the Utility. Since the first installation of a biogas system, Martin Machinery installed many biogas units in the dairy industry. Additionally, the company supplies Biogas Power generation systems from 35 KW to 2000 KW. In 2004, Martin Machinery started an additional company GEN-TEC, LLC to build Utility Paralleling Switchgear, Engine Control Systems and Custom Switchgear. In 2008, Martin Machinery also started Energy Cube, a gas scrubber and gas handling equipment company. In 2015, Martin Energy Group was formed as Marcus R. Martin completed the company buyout. Martin Energy Group is the same group of people with a greater focus on Complete Power Package Systems for the biogas and natural gas markets: power generation, co-generation, tri-generation and quad-generation. Martin Energy Group also has switchgear, controls, gas handling and scrubbing equipment. TEDOM s.r.o. 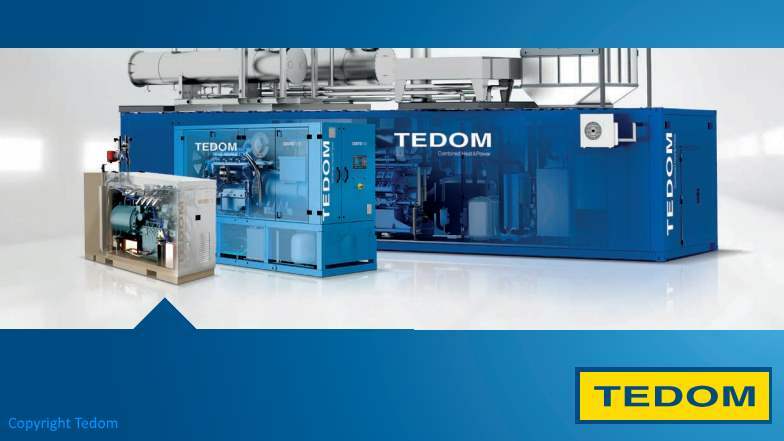 Czech Republic TEDOM is a producer of gas generator sets and cogeneration based on combustion engines. It manufactures combustion engines for stationary application for natural gas and biogas. TEDOM supplies to the US market from the Czech Republic through its US subsidiary company. In most commercially run biogas power plants today, internal combustion motors have become the standard technology either as gas or diesel motors. Diesel Engines operate on biogas only in dual fuel mode. To facilitate the ignition of the biogas, a small amount of ignition gas is injected together with the biogas. Modern pilot injection gas engines (“Zündstrahlmotoren”) need about 2% additional ignition oil. 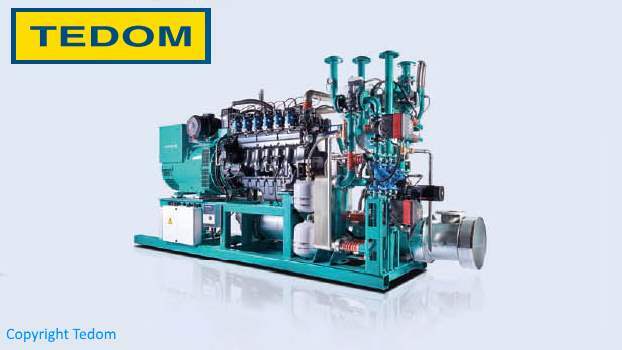 Almost every diesel engine can be converted into a pilot injection gas engine. These motors running in dual fuel mode have the advantage that they can also use gas with low heating value. But in that case, they consume a considerable amount of diesel. Up to engine sizes of about 200kW the pilot injection engines seem to have advantages against gas motors due to slightly higher efficiency (3-4% higher) and lower investment costs. Gas Motors with spark ignition (Otto system) can operate on biogas alone. In practice, a small amount of petrol (gasoline) is often used to start the engine. 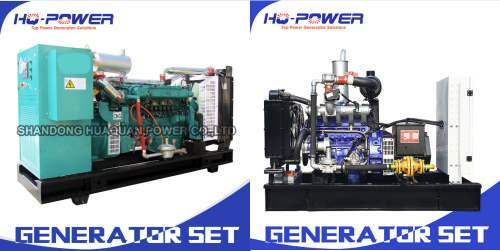 This technology is used for very small generator sets (~ 0.5-10 kW) as well as for large power plants. Especially in Germany, these engines have advantages as they do not need additional fossil fuels that would lead to lower feed-in tariffs according to the Renewable Energy Law (EEG). Gas Turbines are occasionally used as biogas engines especially in the US. They are very small and can meet the strict exhaust emissions requirements of the California Air Resources Board (CARB) for operation on landfill and digester gases. Small biogas turbines with power outputs of 30-75 kW are available in the market. However, they are rarely used for small-scale applications in developing countries. They are expensive and due to their spinning at very high speeds and the high operating temperatures, the design and manufacturing of gas turbines is a challenging issue from both the engineering and material point of view. Maintenance of such a turbine is very different from well-known maintenance of a truck engine and therefore requires specific skills. Today, experience of the use of combustion motors to produce electricity from biogas is extensive; this can be regarded as a proven standard technology. Over 4,000 biogas plants with internal combustion motors are in operation in Germany. However, it has taken lengthy and determined effort to make this technology as durable and reliable as it is today. Internal combustion motors have high requirements in terms of fuel quality. Harmful components – especially hydrogen sulphide (H2S)¬ – in the gas can shorten the lifetime of a motor considerably and cause serious damage. “It’s not rocket science, says Niwa’s Rupert Craggs. Recently he and a few others demonstrated how easy it is to use the gas from AD plants in a biogas electric generator, even from the biogas that comes off farm effluent ponds, using a converted generator. gases Gas is one of the four fundamental states of matter (the others being solid. organic matter Organic matter or natural organic matter ( NOM ) refers to the large pool of carbon-based compounds found within natural and engineered environments. agricultural waste Green waste also called agricultural waste is supposed to be biodegradable waste that can be composed of garden or park waste. manure Manure is organic matter. municipal waste Municipal solid waste ( MSW ). plant material Vascular tissue is a complex conducting tissue. sewage Sewage (or domestic wastewater or municipal wastewater ) is a type of wastewater that is produced from a community of people. It is characterized by volume or rate of flow. green waste Green waste also called agricultural waste is supposed to be biodegradable waste that can be composed of garden or park waste. renewable energy Renewable energy is energy that is collected from renewable resources. fermentation Fermentation is a metabolic process that consumes sugar in the absence of oxygen. The products are organic acids. siloxanes A siloxane is a functional group in organosilicon chemistry with the Si–O–Si linkage. The parent siloxanes include the oligomeric and polymeric hydrides with the formulae H(OSiH 2 ) n OH and (OSiH 2 ) n . Siloxanes also include branched compounds. hydrogen Hydrogen is a chemical element with symbol H and atomic number 1.
carbon monoxide Carbon monoxide ( CO ) is a colourless gas. natural gas Natural gas is a naturally occurring hydrocarbon gas mixture consisting primarily of methane. 2014/34/EU The ATEX directive consists of two EU directives describing what equipment and work space is allowed in an environment with an explosive atmosphere . silage Silage is fermented grass/ hay. water Water is a transparent liquid abundant on earth. I thought about this, electric from the biogas. You burn it. it clean. Appreciate it for putting up.